"Anthropology is exceptionally relevant as a tool for understanding the contemporary world, yet it is absent from nearly every important public debate in the Anglophone world. In fact, it has almost gone underground in the English-speaking world. Paradoxically, as the discipline has grown, its perceived wider relevance has diminished. 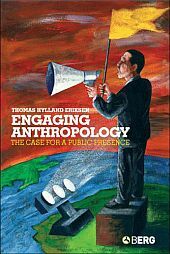 There are more of us anthropologists than ever before, yet fewer reach out to communicate with a wider world", Thomas Hylland Eriksen writes in his new book "Engaging Anthropology". I've just started reading the book and am going to blog more about it the following days. Some of the questions raised in the book are: How can anthropology become more relevant for the "outside world"? What has anthropology to offer? Why do anthropologists fail to engage a wider public? Anthropologists have an enormous amount of knowledge about human lives and most of them know something profound about what it is that makes people different and what makes us all similar. Yet there seems to be a professional reluctance to share this knowledge with a wider readership. Translating from other cultures is what we are paid to do; translating for the benefit of readers outside the in-group seems much less urgent. The problem is that all these fine analytic texts, often brimming with insights and novel angles, rarely build bridges connecting them with the concerns of nonspecialists. Also, they are far too rarely supplemented by writings aimed at engaging a wider readership. (...) When did you last read a proper page-turner written by an anthropologist? Scholarly works of great and enduring importance were published from the 1960s to the 1980s by Claude Lévi-Strauss, Mary Douglas, Victor Turner etc. Yet, the response from the nonacademic world was negligible, and this generation seemed to have no Margaret Mead to take current ideas and run with them. The discipline had become almost self-contained. I suspect that not a few anthropologists have lost their original motivation for studying the subject – understanding Humanity, or changing the world – on the way, replacing it with the intrinsic values of professionalism. And yet, just as the anthropological travelogue may be complementary to the monograph, the engaged pamphlet can often be a necessary complement to the analytical treatise. However, that pamphlet is written too rarely. It gives no points in the academic credit system, it may cause embarrassment among colleagues and controversy to be sorted out by oneself. The easy way out, and the solution most beneficial to one’s career, consists in limiting oneself to scholarly work. Assuming that Leach was right in claiming that most anthropologists were failed novelists, here is a chance to become a truly creative writer without having to invent persons and events. The essay, unlike the article, is inconclusive. It plays with ideas, juxtaposing them, trying them out, discarding some ideas on the way, following others to their logical conclusion. In the essay, the writer sees the reader as an ally and fellow-traveller, not as an antagonist to be defeated or persuaded. The essay appeals to the reader’s common sense, it may occasionally address him directly, and the essayist tries to ensure that the reader follows her out on whichever limb she is heading for. Strangely enough for us behind the screens: Hylland Eriksen doesn't mention blogging. Blogs are as experimental as the essay form (or rather more). Additionally, blogs invite the reader to discuss with the anthropologist. You can read the whole first chapter on Thomas Hylland Eriksens homepage. Engaging Anthropology looks like it will be a fascinating book to read. There’s a post about it on antropologi.info. One of my favourite books is Popularizing Anthropology by McClancy and McDonaugh which makes a strong argument that if anthropology (and science) is publically funded then there is an obligation to make your results accessible to the public. They also make the argument that popular does not automatically mean unscholarly. i agree with the book–anthropology has become “ethnocentric” to itself, making itself less and less relevant to the world it supposedly serves. i graduated with an MA in Applied Anthro in 2004, went to my first AAA mtg in Atlanta, and couldn’t believe what i saw. Applied anthropology is completely marginalized by the ivory-towered majority! Although the Applied degree is fairly new, its not that new, being around for atleast 20 yrs, but still the runt of the litter where anthropology itself is concerned. Why? Perhaps because Applied means to take the tools out of the tower and to the world, where anthropology’s insights are sorely needed. From what I found last year, Applied need not “apply” since many consider this area “tainted". During the Applied seminar I mentioned that collaboration is not something supported in anthropology–as in anths collaborating w/each other and other scientists to write articles and monographs, and asked why. The panelists replied that 1. Anthropology is a “solitary” occupation, and 2. Anthros don’t want collaboration with other disciplines, especially those involving anything corporate, for fear of ‘contamination’. But why then do other scientific disciplines manage collaborations between their scholarly and clinical branches? Even collaborations between two within the same branch? Surely sociologists have been doing this for years which has generated good PR, a bonus. I hope Eriksen’s book is the start of a trend towards dialog–which results in action. I find it ridiculously ironic that anthropology, the study of humans, is ethnocentric unto itself. This long pondering of the discipline’s navel hasn’t helped at all, the less we engage with the real world, the more irrelevant the discipline becomes, no matter how good the core ideas and information are. Just want to say, first, that I agree completely with what Patricia says. Recalling how I myself became an anthropologist, I cannot in good conscience deny that I was a solitary child often found in a longing but liminal position vis-a-vis my peers. My response was to seek exotic activities that I could pursue on my own, thus avoiding the rejection I feared. As luck would have it, my fieldwork included my then newly married wife, and falling out of academia led to a career in an around the Japanese advertising world, where cooperation,team play, and communication with the public are very much the name of the game. I can only wish that more of my fellow anthropologists shared a similar experience. There seems to be big differences between Scandinavia and UK / USA. Here, nearly everybody knows what anthropology is and anthropologists aren’t margenalized at all. Nearly every day, anthropologists appear in the Scandinavian media. I think we all agree that blogs has potential to be the forum that public anthropologists have been looking for - “not mediated by a newspaper editor’s desire for a certain type of story” - as Noah Porter writes. I think there is a great fear of being used by politicians for political ends. And I think this is not unlikely that these things might happen. Look at how for instance Unni Wikan has been simplified and used for supporting politics not of her own choosing. But we cannot cling to the exuse that we are misunderstood. We as anthropologists need to go more public, and perhaps be will grow better at it with more practice. It is difficult to get our balanced arguments through in the media, but we ought to try. A lot of people would take a great interest in what we do if they were only more aware, and it is our responsibility to make them aware.